A new study has found that patients with atherosclerotic cardiovascular disease cut their risk of a second major adverse cardiovascular event by almost 50 percent, if they adhere to taking a statin medication as prescribed by their doctors. SALT LAKE CITY, UT, USA, March 18, 2019 /EINPresswire.com/ — A new study has found that patients with atherosclerotic cardiovascular disease cut their risk of a second major adverse cardiovascular event by almost 50 percent, if they adhere to taking a statin medication as prescribed by their doctors. While that’s good news for patients, the bad news, however, is that researchers from the Intermountain Healthcare Heart Institute in Salt Lake City found that only about six percent of patients are in fact following the statin regimen given to them to lower their cholesterol, negating any potential cardiovascular benefits. Results of the study were presented on March 16 at the American College of Cardiology Scientific Sessions in New Orleans. 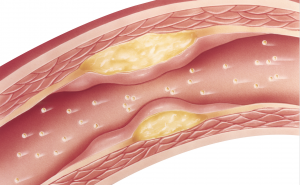 In the study, researchers identified 5,468 patients first diagnosed with atherosclerotic cardiovascular disease between 1999 and 2013. These patients received a statin prescription to reduce their cholesterol within the first 12 months of diagnosis. Researchers then looked at two things: whether or not the patients took their medication, and how many major adverse clinical events (stroke, heart attack, or death) they had over the next five years. They found that patients with optimal adherence — who took their statins as prescribed at least 80 percent of the time — reduced their risk of dying or having a heart attack or stroke by nearly 50 percent. Unfortunately, though, only 351 out of those 5,468 patients fell into the optimal adherence category — which is about six percent. Researchers also found that 25 percent of patients never filled their statin prescription in the first place, and 25 percent didn’t fill their second one. Researchers think there are several reasons for non-adherence, including a bias against statins, concern that they’re already taking too many medications, worry about side-effects, the incorrect belief that after a few years on statins, they’re cured and don’t need to take them anymore, or they are just not that important. The cost of the drugs is most likely not a factor, researchers say, since all of the patients in the study were enrolled in SelectHealth insurance, and the statins cost them only about $10 for a 90-day supply. Dr. May believes the importance of taking statins could be lost in the abundance of information patients are given at discharge. “During this time, patients most likely don’t feel their best, they’re probably scared about what just happened to them, and nervous about their future. They may not be able to process everything that’s happening and how to best follow up,” she said. Dr. May added that the findings of the study should help caregivers see how crucial it is to ensure their patients who are being discharged understand the importance of the medication, and that continual education needs to be provided about the importance of taking their medications as prescribed. “The patients should be asked about whether or not they’re taking their statin at their follow-up appointments, especially soon after discharge,” Dr. May said. For the study, researchers from Intermountain Healthcare collaborated with The Medicines Company.